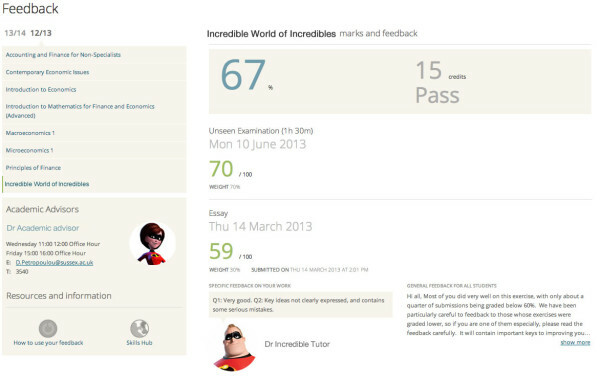 Sussex Blogs > E-learning team blog > moodle2 > moodle2 evaluation & integration > data integration > Where is my feedback? Tutors give feedback to formal assessments via our student administrative system. 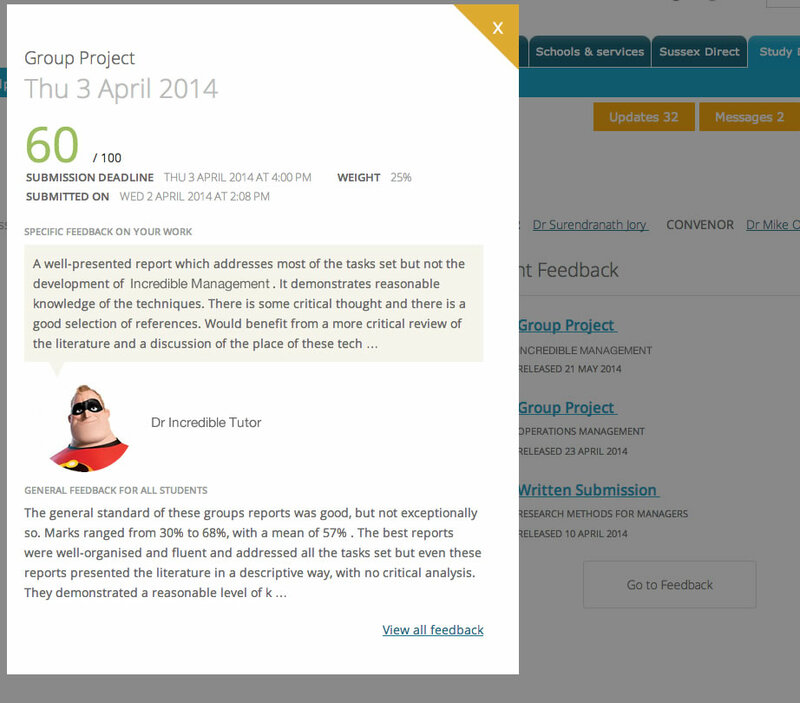 Up until March this year the students accessed this feedback through the same system. Now we have now added a new view of the data through our learning system (Moodle). We feel assessments are core to students’ learning. They’re often the motivation for study and guides their focus. Feedback to assessments is also important. It gives an indication of the quality of the students’ performance in the task and offers insights in what they can do to improve. Consequently, we recognise that assessments and feedback to those assessments sit as comfortably in the institutional learning system (Moodle) as the administration system. We have implemented the new feedback pages within our Moodle at the same time as the new student home pages which focus the students on their entire degree programme. 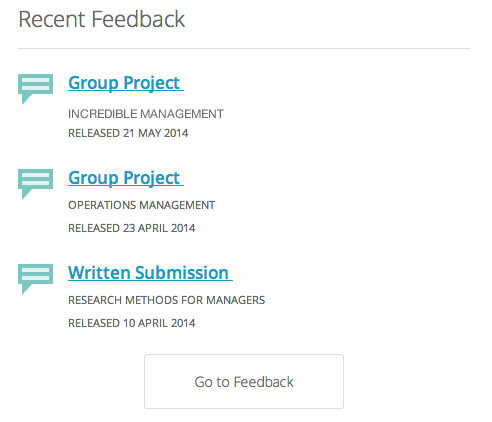 We provide access points to the feedback from our student home page through a recent feedback panel. 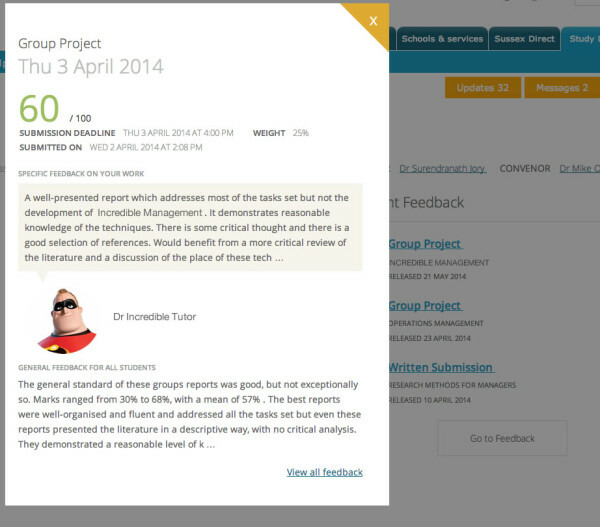 In this panel feedback is listed according to the time when they received it, merging feedback from different courses (modules *). The purpose of the panel’s display choice is to emphasise the crossover points of their learning between courses and the relevance of feedback to their whole educational journey, rather than feedback having isolated relevance to particular courses. Strategically the project has been designed to help improve results in the UK National Student Survey (NSS); a survey which gathers data about the students’ overall perception of their degree programme. Year on year the students from all UK institutions, but particularly Sussex, have reported not receiving adequate feedback about their assessments. It seemed to us that the the tutors were doing their bit in providing the feedback, but due to problems in our information hierarchy the students were not finding it. By creating a degree programme landing page in our Moodle with links to more detailed feedback pages (the notifications panel) we hope to maximise on the tutors’ efforts to provide feedback. What do the feedback pages look like? The pages also includes a panel which links them to further help, such as the academic advisors’ contact details. Like the new front page, the feedback pages simply integrate the data that already exists within our student system into the students’ learning space, aka Moodle. Although we don’t yet have any hard evidence, we hope that by representing the students’ feedback through their learning system it will increase its relevance, the students’ perception about the amount of feedback they receive will improve and, because of its improved presentation, perhaps even their perception of its quality. There are two more important projects in the pipeline too. The next stage of this project will be to allow online submissions for all first years. These submissions will be checked against the Turnitin database for similarities with other papers and will be graded online using Turnitin’s Grademark tool. The grades will be synced with Moodle and sent to the student assessment system for conflation and applying administrative rules. We will blog more about this as the project progresses. The final stage of the project will be integrate course level information with our Moodle including the course outline, learning outcomes, tutors, assessment deadlines and recent feedback. This will populate the first section of Moodle courses with institutional data before the tutor even starts adding learning materials and activities. And we will also blog more about this as the project progresses. As always comments and feedback welcomely received.